Coralgin 60 Capsidney stone shed. 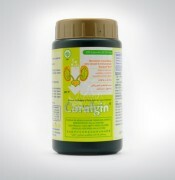 Launched urination and prevent the formation of kidney stones. Potassium in the kejibeling are strong diuretic and can dissolve rock salt formed from calcium oxalate and calcium carbonate in the gall bladder, bladder and kidneys. Helped break down oxalate stones in the kidney and urinary tract and help launch urination. It is advisable to drink at least 2.5 liters of water per day. Only for people with kidney stones and bladder stones that have been set by physicians. During the use of your doctor on a regular basis. If there is no improvement in symptoms, call your doctor immediately.